Veterans Day, Sunday, November 11, 2018 is fast approaching. Shelby County Memorial Veterans of Foreign Wars and the Auxiliary cordially invites you to attend their remembrance program that will be held in the 1885 Historic Courthouse at 1 pm that day. The 100th anniversary that ended World War I will be celebrated as will the lives of 884 citizens from Shelby County who served during that time. 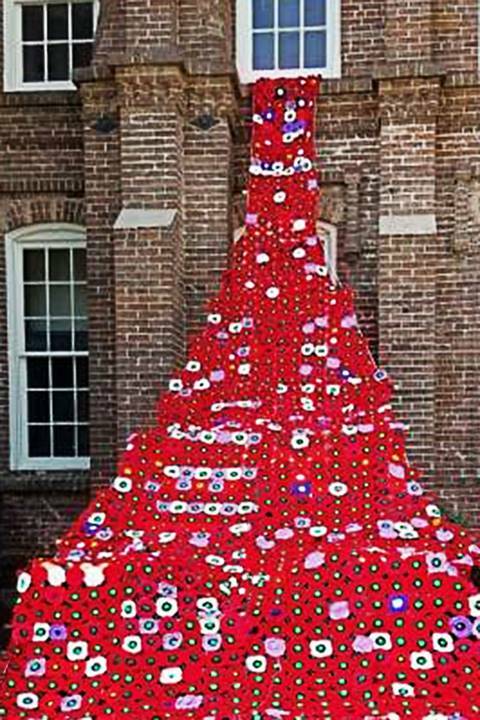 During the past year the Auxiliary and other citizens from the community have completed the knitting of over 2500 remembrance poppies for their “Weeping Window” that will be on display that day. Flowing out of one of the windows will be knitted poppies of; red, representing blood shed by Americans in the World War; white for the nurses who served, tended to the sick and wounded and died from disease, accidents and enemy action; and purple for the animals who also served and died in the chaos of war. The Weeping Window should make a great photo opportunity to remember those who served a century ago.